Arbiters are masters of negotiation and diplomacy. With the aid of the Force, these Consulars seek peaceful solutions to even the most dangerous of situations. 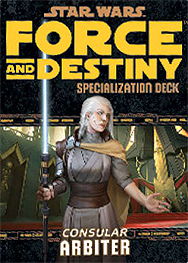 This deck requires the Force and Destiny Core Rulebook and Disciples of Harmony It includes cards for all 20 talents available in the Arbiter specialization.